Florida Georgia Line. I’ve heard that’s the name of a good country music band. I wouldn’t know–I don’t listen to country music on purpose. Ever. I wouldn’t want that band name these days though. It’s an awful place. Why have hostility toward an American state line? I have driven across it many times on my way to the beach or my parents’ home, or even the unfortunate time I went to Universal Studios. I have driven across it more times than I can remember, but I know I never drove across it without my golf clubs in the back. It has largely been a happy place for me. Not anymore. Here’s the complaint. It appears that at least up until Tuesday, the Florida-Georgia state line was the center of American voter suppression. No matter on what side of it one stood, that person would have an excellent argument that they were in the apex of voting hell–only to have to concede that the person on the other side might have a better case. I have gotten a good dose of what has happened in Georgia this election season. The still unresolved gubernatorial election between Democrat Stacey Abrams and Republican Brian Kemp has put the “exact match” law in Georgia in the spotlight. What’s that law all about? The 2017 law passed by the Georgia General Assembly requires registration application information to match driver’s license, state ID card or Social Security records. And when Georgia says “exact,” it means it. Prior to the election, more than 53,000 people who tried to sign up to vote had not been added to the active voter list. Some for as little as a stray hyphen. Supporters of the law might say that is 53,000 opportunities for the spread of the sinister voting fraud epidemic to be thwarted. Whew! The rest of us might say this is a racist way to suppress voting. With an estimated 80% of the flagged registrations belonging to non-white people, it would be hard to argue otherwise. It’s the kind of law that might make someone living in southern Georgia pack up and move to the other side of the state line to the south. Of course, up until Tuesday, Florida practically had the voter suppression market cornered. 53,000 people being flagged and prohibited from voting? Child’s play. 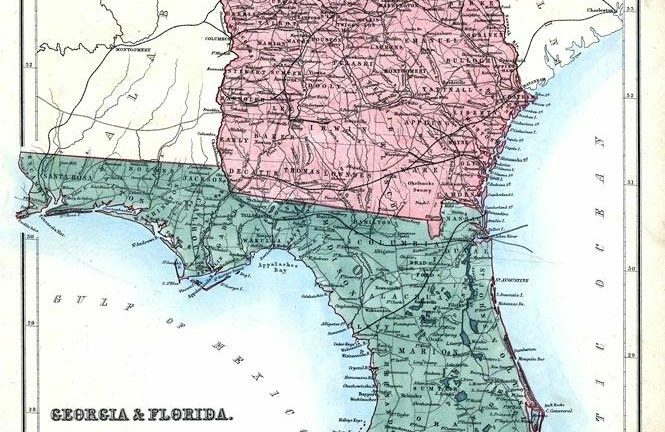 Down in Florida, the state’s 1868 Constitution contains a voting ban for felons that was still in effect. That ban made more than 1.5 million Florida residents who have already served their sentences ineligible to vote this year alone. No, that is not a typo. It had been in place for 150 years, and it was put into the state’s constitution during Reconstruction specifically to suppress the African American vote. The Washington Post published an excellent piece on the Florida constitutional referendum that successfully repealed the provision on Tuesday. It took 1.1 million signatures to get it on the ballot, and over 60% of voters to approve it. This year’s election was the last one under that old provision. In 2016, more than 418,000 African Americans were not eligible to vote under the now repealed law, according to an article in Vox. For perspective, Andrew Gillum, the African American candidate for governor in Florida is losing the election to Ron DeSantis by less than 40,000 votes. In the hotly contested U.S. Senate race in Florida, the current governor and staunch enforcer of the old constitutional voter suppression law, Rick Scott, leads incumbent Bill Nelson by about 34,000 votes. Both election results are likely headed for a recount. Florida will be a different electorate in 2020. My voting location happens to be at the Benjamin Harrison Presidential Site. I think about that irony every time I vote. His presidential election is marred by what has since become a dark cloud of “vote buying” which led to his defeat of Grover Cleveland in 1888. No one has even offered to buy my vote at his Indianapolis memorial, though with each election I come with renewed hope. So, back to the line. With the elimination of the racist amendment in Florida, I give that side the edge on the scale of modern voter freedom over their neighbors to the north. And since I won’t ever go back to Universal Studios again, or listen to country music, I can keep dreaming of the days I live out my own voter freedom on a south Florida beach. Georgia, the next time I write about your racist ways, I hope it can be in reference to The Masters. Good luck with the headaches that come with the recounts and runoffs this year. Both states have certainly earned them.